What do Simon Cowell, Richard Branson and Deborah Meaden all have in common? The answer may surprise you - all of them left school with few formal qualifications! Although youth unemployment in Scotland has been decreasing in recent times, many young people in South Lanarkshire continue to face multiple barriers into employment. Low confidence, lack of qualifications, little or no work experience, health issues and poor public transport are often the biggest barriers. Skills Exchange (SCIO) based in Lanark offers training and support for these young people. For example, the LEADER funded ‘Moving On 2’ programme works with young people aged 18 to 24, offering individual support to help them move towards the world of work. 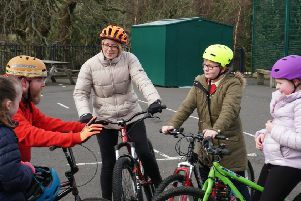 Raising aspirations in young people who many have little self-belief, confidence in their abilities and hope for the future is something that Skills Exchange does well. Integral to the success of their training courses is working in partnership with local employers, matching young people and opportunities through work placements and helping to fill vacancies. One of the companies which they have successfully worked with is Forster Group. Founded in 1990, Forster is a well-established family-owned contractor recognised for the excellent quality and service it provides within the new house build, public, commercial and renewable sectors. Two young people from Clydesdale, Connor Kirk and Craig Bell, have successfully taken up apprenticeships with the company having first had support from Skills Exchange. Forster is a company that actively seeks to recruit young people from areas that are socially challenged as well as rural and remote. If you are from a company which could offer work experience to a young person to help them on the road to success or are a young person looking for help, then please call Skills Exchange (SCIO) 01555 661094.